Google confirmed yesterday that it has acquired Boston Dynamics, maker of creepy walking humanoids and creepy running animal bots. Talk about a power couple. Google declined to tell The New York Times how much it paid for the robot engineering company. While Boston Dynamics works closely with the Pentagon to develop battlefield-ready robots, Google says it does not plan on becoming a military contractor on its own. 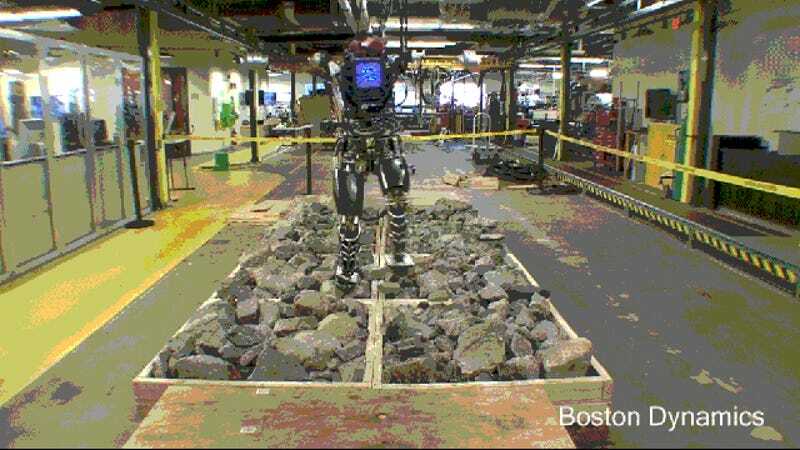 Existing Boston Dynamics military contracts will be honored. Google is moving into the robotics realm in a big way: Boston Dynamics is the eighth robotics company the internet giant has acquired in the past six months. What Google plans to do with all this robot knowledge hasn't been made expressly known. The robotics team is led by Andy Rubin, who recently stepped down as head of Android. In an interview with The New York Times last week, Rubin was tight-lipped about what the robotics team has in store for the "moonshot" project. There's plenty of speculation that Google wants to create an automated manufacturing or retail system, similar to Amazon's product picking robots.